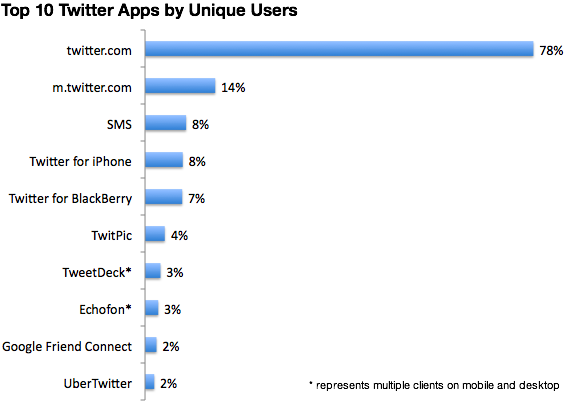 When I read Twitter CEO Evan Williams post tonight about the state of Twitter from a mobile perspective, the first thing that jumped out at me what that Twitter for Android, an app Twitter worked hard on, isn’t even in the top 10 most-used apps for the service. But Williams also used the post to whip out some impressive numbers. Chief among them: Twitter now has over 145 million registered users (though presumably less than 150 million, or he would have said that). And there are now nearly 300,000 registered apps in the Twitter ecosystem. The latter number above is technically the number of registered OAuth apps in the ecosystem (and includes multiple instances of some apps). Twitter made the switch over from basic authentication to OAuth a few days ago, leaving behind some apps, such as the old Tweetie (which was reborn as Twitter for iPhone). Williams says this number of registered apps has tripled since their Chirp conference — which was only this past April. Lastly, he throws in that Twitter’s Promoted Products (read: their first big monetization pitch) has “exceeded our expectations.” No word on if that means Twitter has turned a profit, but that seems pretty unlikely. Still, revenues are undoubtedly growing.